The 12th edition of the Indian Premier League is barely into its first week. We have seen high skills on display, Brobdingnagian strikes, heart-pumping finishes and some of the best death bowling that you’ll ever see, worthy of grabbing the eyeballs as well as the headlines. But, it is the controversies that have overshadowed everything. First, it was the Ashwin-Buttler ‘Mankad’ scandal that saw tempers flay and opinions divided as far as the ‘Spirit of Cricket’ is concerned. And, just as normalcy was about to prevail, we saw another controversy make its mark in what was easily the best game of the tournament thus far- RCB vs MI. On a day where we should have been gasping in the after-effect of such a high octane game that saw a plethora of high-skilled professionals showcase their talent in a single game, it is a pity really that we are talking about an Umpiring blunder at the end of it, where, instead we should have been talking about the death-bowling genius of Jasprit Bumrah, Yuvraj Singh’s winding the clock back with three consecutive sixes’, Pandya’s death-over exploits, Virat Kohli’s cover-drives or AB de Villiers’ 360 degree strokeplay. Here’s what happened: Lasith Malinga, who had been carted for a six over long-on off the first ball of the last over, brought his experience to the fore in the succeeding deliveries, nailing the yorkers at will to bring the equation down to 7 off the last ball. He follows it up a low-loopy ball outside the off-stump, which Dube only managed to swing it wide of long-on. The Challengers fall short by six runs; the Mumbai Indians’ players- ecstatic, and rightly so, mob Lasith Malinga in unison. A pin-drop silence descends at the Chinnaswamy for a second, up until something props up on the big screen. Wait! 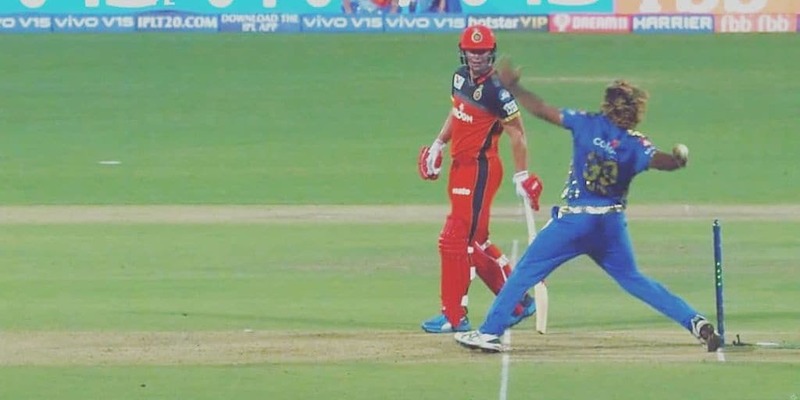 Malinga has overstepped by a couple of inches; it is a big no ball, and Umpire S Ravi is the usual suspect. The crowd went in a frenzy; skipper Virat Kohli and bowling coach Ashish Nehra vent out their anger, but the intractable cricket laws do not allow the ball to re-bowled. “We are playing at the IPL level and not playing club cricket. The umpires should have had their eyes open. That is a ridiculous call (last ball). If it is a game of margins, I don't know what is happening. They should have been more sharp and careful out there.” said an understandably fuming Virat Kohli at the post-match presentation. Even Rohit Sharma, when asked for his views on the no-ball was quick to point out or rather remind everyone about the controversially adjudged wide in the penultimate Jasprit Bumrah over. There has always been some question mark regarding the credentials of Indian Umpires at the International level, and that it came from S Ravi- the only Indian umpire in the ICC Elite panel accentuates the question marks further. And, off-course, this was not the first time that S Ravi has made unforgivable howlers. A few months ago, during a Test match between Sri Lanka and England, a detailed analysis showed that a whopping 40 percent of the deliveries bowled by Lakshan Sandakan were actually no balls. This is has been a recurring trend in the past few years where the Umpires are consistently failing to call the no balls, which brings the DRS rule of checking the no-ball in case of a wicket into the spotlight. With the rule in place, a no ball is only checked when a batsman is dismissed, which in itself raised the basic question: With a plethora of technology at disposal, shouldn’t these no balls be sent for a check upstairs to the third umpire, and if it really is a no-ball, the same can be communicated to the on-field umpire before the next ball is bowled; as simple as it gets really. Another line of thought that emerges from this blunder is: if the time has come to use a line-based technology [which uses a sensor to call out the no-ball, once the bowler has landed his feet over the popping crease] like the one used in Tennis. The line of thought was echoed by former cricketers and analysts on social media with the likes of Harsha Bhogle and Faf du Plessis calling out for the involvement of the third umpire and technology to eliminate such howlers. The controversy also once again highlighted the dark spot that cricket needs to address, for such howlers affect a teams’ chances, deny fans of a greater experience, especially when the stakes attached to a game is at its premium. Imagine, it’s a World Cup final, and the umpire fails to call the no-ball off the last ball, it will not only prove fatal for the batting side but even for a winning team, it will take the sheen away from what would be a monumental achievement. It’s a real shame that a game where we saw such high-class performers display their talents and skills at different stages, a game where we should have been talking more about Jasprit Bumrah’s brilliance as a death bowler or his battle with Virat Kohli or AB de Villiers’ exquisite strokeplay or Yuvraj Singh’s vintage hitting, ended up with such a howler, serving a reminder to the authorities that the ‘dark spot’ needs to be addressed, and the time to do it is- NOW.